Cheer on Jimmie Johnson as he leads the pack in 2018 in search of his 8th Championship. 100% cotton black t-shirt features image of the 2018 Lowes for Pros paint scheme and sweet graphics. Love my 2018 cars including both sizes . I have a large size collection of most of Jimmie's cars. I also was going to buy a shirt, but not available in my size. Any idea when/if you will have anymore. Jimmie get that checkerd fl as this Sunday. You got this. 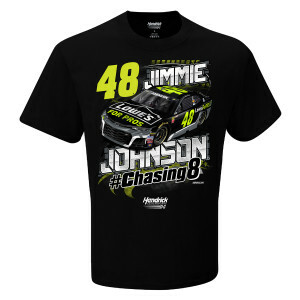 Love the selection of Jimmie sports wear.